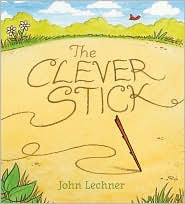 The Clever Stick is the second picture book from the multitalented author, illustrator and animator, John Lechner, creator of the brilliant comic book for younger kids, Sticky Burr, a review of which can be read here. John Lechner is also Art Director for FableVision, the children's media company founded by the amazing illustrator and author Peter H Reynolds. In addition to writing and illustrating his own books, Lechner, who was a puppeteer for many years, directs films and designs children's software and educational websites for FableVision. Lechner's website for his own books is a treat, full of book related short movies, comic strips and songs (John's brother is a musician and writes the scores for his films). The website for FableVision is equally capitvating, keeping my son and me pretty busy for a while reading books, watching short animated movies and playing games. Definitely worth a visit. I already knew I loved John Lechner's work after reading Sticky Burr, but reading his two picture books, A Froggy Fable and The Clever Stick, cemented it for me. Lechner's books seem to exist at the edges of the magical forest created by William Steig. This is a forest that is populated by a wide ranging cast of anthropomorphized animals who are philosophical, introspective, artistic. It is also a forest filled with bewitched objects like magic pebbles, talking bones and enchanted harmonicas. Lechner's books are more concise in their storytelling than Steig's, but, like Steig, he manages to work wonderful vocabulary into his text. Words like simile, vigorously, magnificent, rapt and tapestry are used both subtly and effectively in the telling of the Stick's story. And, like Steig, Lechner's illustrations are bright and crisp, with characters and settings outlined in black. In addition to writing children's books, Steig was a cartoonist for The New Yorker magazine and other publications for many years and this shows in his artwork. Similarly, Lechner's Sticky Burr is in comic book format and he writes a weekly black and white strip for Sticky that can be read at his website. The Clever Stick begins, "Once upon a time, there was a clever stick. Ever since he had fallen off the tree, he had been sharp." The humor in this book is understated and will probably be missed by kids, but not by parents, which makes it a joy to read. Since I bought The Clever Stick last week, I have read it twice to my son and three times at story time at the bookstore and I still get a kick out of it. The stick likes to sit in the sand and think clever thoughts. He likes to float down the river making up poetry. He enjoys listening to the birds sing and wonders what makes it sound so beautiful. His only problem is that he can not communicate with the other creatures of the forest and share his thoughts, clever or otherwise. He wants to tell the squirrels where to find the best nuts, he wants to tell the wild rose how beautiful she is and he wants to share similes with the frog writing poetry as he sits on his lily pad. Frustrated by his thwarted efforts, he sadly drags himself home one day. On the way home, he realizes he is leaving a trail in the sand. An interesting trail. And, "to his amazement, he discovered that he could draw lines to look like things." He goes on to create a spectacular work of art and the forest finally takes takes notice of him. "The animals cheered, the insects buzzed, and the trees swayed their branches in approval. Even the rose rose turned her petals to look." Lechner could have ended The Clever Stick at this point and it would have been a children's book worth buying. However, he goes on with an ending that makes it a children's book worth buying for your own family and one you will want to give as a gift to others. However, as adults, we know that life continues on after glowing moments of success, sometimes even turing to kick us in the behind. And, it would seem that the same is in store for the stick when the first drop of rain beings to fall, washing away his masterpiece. But, this is no ordinary stick. This is a Clever Stick! The stick "didn't care. He knew he could make another. He knew at last he had found his voice. But for now, the stick didn't want to get wet. So, he took a fallen leaf and made himself an umbrella. For he truly was a clever stick." I just want to tell you that although I rarely (or never) make comments here and I often don't click through from my email subscription to your blog, when I do it is always worthwhile. I love your reviews and I love your choices. You have led me to many great children's books to share with my five-year-old. We bought Abel's Island on your recommendation and loved it. I plan to buy this one for my girl who wants to be an artist. Anyway, I'm not saying it well but I love your blog. Keep up the great work! Thank you! Your comment means so much to me! I realize that I get a little bit more passionate about certain books than the average person, but when I can pass on the spark that is struck in me when I read a great book, pass on the wonderful experience of reading a good book, I am so happy. I appreciate your taking the time to let me know that the spark travels on! ps - For your burgeoning artist, check out Peter H Reynolds' picture book titled "ish." As wonderful as Lechner's book! After reading the first line, "ever since he had fallen off the tree, he had been sharp", I could almost hear a drum and cymbal go Bu,Dump,Bump. "Is this mic on":-) When he tried to say hello, and stumbled over a pebble and fell on his face, my oldest laughed out loud. At the end we discussed various ways of communicating without using words: sign language, gesturing, dance, painting, drawing. Be sure to check out Lechner's Sitcky Burr comic books! Lots of fun! His website is great, too.